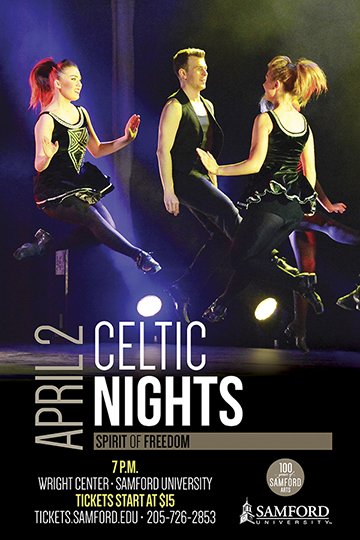 World-renowned Irish musical group Celtic Nights will perform at Samford University’s Wright Center April 2 at 7 p.m. The show, entitled Spirit of Freedom, celebrates the centennial of the Easter Rising of 1916. The multitalented, 14-member cast consists of singers, dancers, musicians and actors. Producer Michael Durkan explained that the show portrays the authentic folk elements of Irish music and dance in the context of a modern, multimedia experience. The performance is unique in that it includes stories from the often-overlooked women who played a significant role Ireland’s struggle for independence. Specifically, Spirit of Freedom highlights the story of Grace Gifford and Joseph Plunkett, who were married in the Kilmainham jail only a few hours before Plunkett was executed for his part in the rising. Tickets are available online or at the Samford Box Office in Swearingen Hall. Guests can receive a special “buy one get one free” offer by using the promo code BOGOCELTIC. Groups of 20 or more can receive a discounted rate by calling 205-726-2853. Rachel Sinclair is a journalism and mass communication major and a public relations assistant in the Division of Marketing and Communication.